A high school art teacher will be working with students who are more serious about art, and therefore must be able to show students different mediums, approaches and techniques. 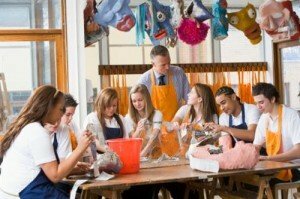 An art teacher who is working with high school students will want to have artistic talent and expertise in certain areas, but still be able to provide a general background on art, art history, technique and form. There are several steps you must take in order to become a high school art teacher. When working in the high school setting, an art teacher must have an expert knowledge of art, the industry, its history and current modern techniques. In order to do this, it is recommended that art teachers earn a degree in art, art history or fine arts before going on to train as a teacher. This is the best way to gain expertise in the subject, as well as be exposed to the different types of art techniques and mediums. For instance, you might be most talented when it comes to working with watercolor, but you will need to introduce your students to many other mediums such as pottery, ceramics, pencils, crayons and oil pastels. Once you have earned your bachelor’s degree, you can complete a teacher certification program to qualify you for teaching within a high school classroom. This program can be done through a community college, university or online learning facility. Accredited online institutions allow aspiring art teachers to earn their teacher certification when it is convenient for them, making it a great option for many on-the-go learners today. Once you have completed your certification program, you will want to get experience working in actual classroom setting. Most bachelor degree programs in education as well as teacher certification programs require future teachers to complete a student teaching internship before they graduate. Student teaching allows a teacher to work side-by-side a veteran classroom instructor on a daily basis for the school year. The student teacher has a chance to plan art lessons, work with students directly, and help them craft their artistic talents. In addition, you will understand what needs to be done behind the scenes once you get your first job as a high school art teacher. Most high schools want to hire art teachers who not only have educational experience in their field, but also have worked in a classroom setting with high school students. All high school teachers must be licensed to teach in the state that they are working in at the time. According to the United States Department of Education, each state has different license requirements, so it’s important to understand the requirements of the state you plan to teach in. Almost every state requires teachers to pass a teaching skills certification exam. In addition, many states require art teachers to pass certifications in the art field. An additional certification that art teachers might want to look into is the National Board Certification which is offered by the National Board for Professional Teaching Standards. This certification, while not mandatory, improves an art teachers opportunity for advancement. In addition to completing the educational requirements necessary to become a high school art teacher, you should also be a creative, inspiring and motivational person. According to Inside Jobs, a high school art teacher must be able to provide students with step-by-step instructions for working with new mediums, while also paying attention to the details. The average high school teacher earns about $53,000 per year, according to the Bureau of Labor Statistics. For more information on this career field, fill out our form today.